Manufacture & retrofit of mine spec. service bodies for light vehicles through to 773F truck. Manufacture & retrofit of mine spec. 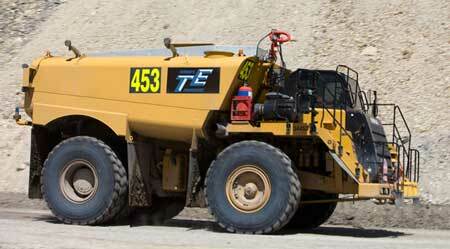 water truck conversion kits for various quarry trucks. Vehicle road worthy inspection and Queensland transport modification plate installation. Where we stand apart from our competitors is our ability to innovate. Nobody wants a “One trick pony”. Versatility is key, if we cannot source a solution for your needs, or one does not exist, we can engineer one. The reality is that Turners Engineering have been innovating, modifying, refurbishing and operating for more than fifty years. In that time we have weathered hardship and met the needs of this ever evolving industry time and again, learning all the hard lessons that some of our competitors are coming to terms with now. Turner’s Engineering will continue to expand, evolve, innovate and help shape the industry that has been the catalyst for our success. We are committed to excellence in every aspect of our business, the environment, the community and the safety of our personnel. We understand your business and what you are looking for in an equipment supplier or contractor as we have the same needs from our own. To sum up Turners Engineering in three words- “Quality through innovation”.